Are you a DBA or senior database developer? 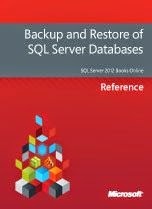 "Backup and Restore of SQL Server Databases" published by Microsoft FREE of cost. So go through this pdf and understand the risk behind database backup/restore process, and how to overcome these risks. Working with data bases I have face the situations when losing important data had horrible results for every member of a team. Now, when new data rooms have been used for a few years, there is need to provide high data security standards that are aimed to provide high-qualitatively backups.